If you are thinking about taking a family cruise, you need to know more about the ship than if it has laundry services, kid-friendly meals, and on board medical care; you need to think about the availability of youth programs that are age appropriate, interesting, and well supervised by staff that are experienced in caring for and recreating children. During the December holidays, I took a cruise on the Norwegian Breakaway that I would describe, not only as kid-friendly, but family friendly as well. Each morning, before I got on an elevator near my cabin, I caught a brief glimpse of young children making their way into one of the youth programs sites for a day of learning activities, games, crafts, and free play with new friends. The Breakaway’s Splash Academy hosts complimentary youth programs that provide children with fun-filled days at sea. Programs give parents the opportunity to enjoy a variety of cruise activities knowing their children are well supervised, and enjoy meeting and playing with others their own age. 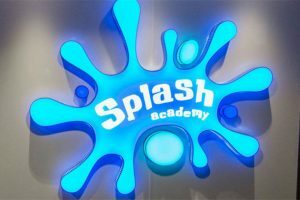 Given my years of running a preschool and seasonal day camps, I was interested in learning more about the Splash Academy and its youth programs while at sea, and when in ports of call. I was given permission to meet with the manager of the youth programs, Carlos Perez. Carlos gave me a tour of the several large, well-maintained and colorfully decorated recreation rooms that are home to the Splash Academy on the 12th floor of the ship. Guppies – ages 6 months to 2 years. Parents participate in the activities, which take place in the Guppies Playroom and are hosted by a certified staff. Activities include, but are not limited to, sensory play, music and movement, ball play and building with blocks. Turtles – Ages 3-5 years. Programs take place in the main Splash Academy recreation areas and include: Arts and crafts, painting, games, sensory play, storytelling, developmental activities, parades and treasure hunts. Dolphins – Ages 10-12 years. Programs are in Splash Academy recreation areas and include: Entourage Takeover, Circus skills and Show (Stilts, Ball Juggling, Chinese Yo-Yo, Plate Spinner and Devil Sticks) scavenger hunts, sports and team building, theme nights, and video games. Entourage – Teens get to hang out and play video games, see movies, enjoy music and sports with others their own age in supervised teen centers around the ship. During days at sea, Splash Academy is open from 9am to noon and 2pm to 5pm and 7pm until 10:30 pm. Carlos shared that Splash Academy has a staff of over 25+ men and women experienced in providing youth programs for children. During my tour, I was impressed to see the modern equipment, and well maintained play areas. The kitchen area and bathroom facilities are sized appropriately for young children. On the last day of the trip, the children who participated in the youth programs, put on a production for their families and other shipboard guests. Norwegian Breakaway delivered a cruise experience for the whole family. Thanks to Splash Academy, parents had free time to enjoy shipboard activities. In addition, kid friendly meals, pool time fun as a family, and other shared activities made for a family-friendly cruise. Not every cruise line offers youth programs, and not all youth programs are created equal; make sure you pick a cruise that has youth programs that will interest each of your children.